Turkish Prime Minister Tayyip Erdogan says he will gladly return an award given to him by a Jewish-American association a decade ago in a letter released by his office, which also called on the US group to condemn Israel’s government policies in Gaza. 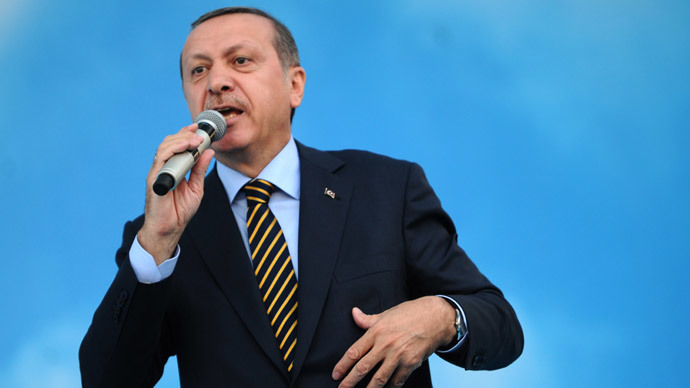 The New York-based American Jewish Congress said in a letter to Erdogan last week that he had become the world's "most virulent anti-Israeli leader" and it demanded that he return the prize. He had been given the award partly for his efforts to broker peace between Israel and the Palestinians 10 years ago. "Prime Minister Erdogan will be glad to return the award given back in 2004," Turkey's ambassador to Washington Serdar Kilic said in the letter addressed to American Jewish Congress President Jack Rosen. Erdogan's office released a copy of the letter to the media, describing it as Turkey's official response. "The absence of this award will not prevent Prime Minister Erdogan from resolutely fighting against terrorism, working towards the peaceful solution of the Israeli-Palestinian conflict and upholding the safety and well-being of the Jewish community in Turkey," the letter continued. Rosen's open letter to Erdogan had cited the Turkish leader's recent comments that Israel had "surpassed Hitler in barbarism" through its attacks on Gaza. 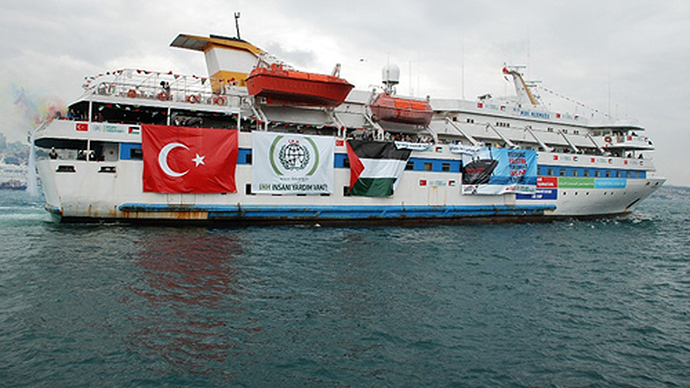 However, there is widespread anger in Turkey at Israel's offensive in Gaza. "Attempts to depict Prime Minister Erdogan's legitimate criticisms of the Israeli government's attacks on civilians as expressions of anti-Semitism is an obvious distortion and an effort to cover up the historical wrongdoings of the Israeli government," the ambassador's letter said. "We would like to urge you to publicly condemn the Israeli government's policies that have caused public outrage around the world," it added. The US State Department called Erdogan's earlier remarks, in which he likened an Israeli MP to Hitler and said the Jewish state was terrorizing the region, "offensive and wrong." Turkey, a member of the U.S.-led NATO military alliance, was once Israel's closest regional ally. 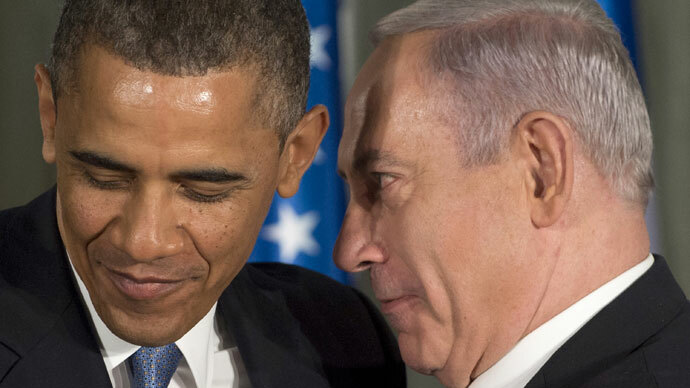 Washington considered it a credible broker in the Middle East peace process. Relations between Ankara and Washington soured when Obama failed to use force against Syria, which led to Erdogan ceasing to hold phone conversations with the US President. "In the past, I was calling him (Obama) directly. Because I can't get the expected results on Syria, our foreign ministers are now talking to each other," Erdogan said in an interview with the pro-government ATV channel. 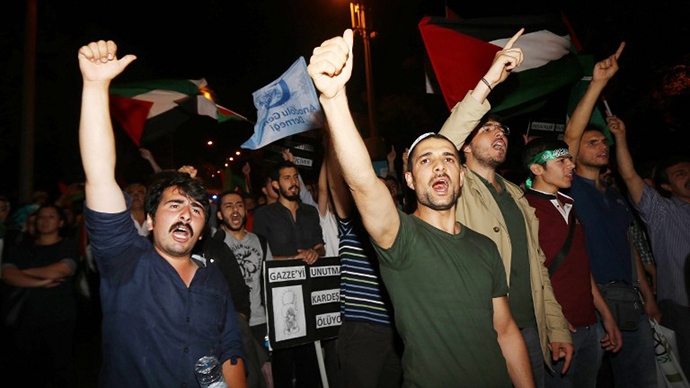 There have been protests in Turkey following Israel’s actions in Gaza. Thousands gathered outside the Israeli Embassy in Ankara on July 18, with pro-Palestinian activists chanting slogans such as "Hail to the resistance from Istanbul to Gaza," "Murderer Israel, get out of Palestine," and "Strike, strike Hamas; strike against Israel." Demonstrators also waved Turkish and Palestinian flags.